Lorenzo Trinidad samples pens from the Sakura Pigma Sensei manga drawing kit. An artist friend was recently mourning what she believed was the passage of what we know as "India" ink. The concoction of carbon black and shellac is not what it once was, that is, dense and mordant, with an earthy, bitter smell and texture. India ink was not designed to be watery and transparent, which commercial varieties have become. Old-style nibbers resort to decanting the liquid, leaving it out and uncovered so that some of the wateriness evaporates. Scratching across the Bristol with a properly flowing nib and ink that is the ideal harmony of liquid tension and opacity is a tactile joy. And one not easily gained. And so we use commercial products, off the shelf. Among the top of the line are Japan's Sakura pens. The company, (which made its fortune with the invention of Cray-Pas), concocted an ultra-fine, dense black ink in the early '80s they called Pigma, in which the color particles are reduced to sub-micron size. This allowed a flow and density unmatched with commercial-grade nibs, and Sakura's line of "Micron" drafting pens became a serious competition to the legendary Koh-i-noor "Rapidograph" technical pens. Anyone who invested in a bank of Rapidographs also bought an ultrasonic cleaner, as the tiny wires in the nib shafts would clog with regularity. The difference between the traditional pen nib and the technical pen was regularity of line. A crowquill has an organic line that waxes and wanes; the technical pens, designed for draftsmen, had strictly uniform outputs. In the hands of artists and cartoonists, both had their uses. With the rise of interest in manga and anime, is there a single set of pens that can produce professional inking, and yet be portable enough for students and lunch-break cartoonists? Sakura has released a set of pens they call Pigma Sensei in a "Manga Drawing" set, with a list price of roughly $13. It's a pretty good deal, as you get four Pigmas of varying nib sizes, a mechanical pencil and a dedicated eraser. » The mechanical pencil is Sakura's 0.7, with a ribbed shaft. It's pretty slim, so the grip helps. Sakura's SJ-100 eraser handily nibbles away at the pencil lines. It's a kind of whitish translucent material that has enough grit to lift the pencil marks, but is weaker than the paper tooth, so a wisp of debris is created while erasing, and the paper is unharmed. Good stuff, but unsurprising. » The 0.3 mm fine-tip pen creates an industrial line rather like a Rapidograph, with just a hint of blot as the point is pulled away from the paper. This point would be handy for cross-hatching. » The 0.4 mm plastic tip also makes a fine line that's a bit more organic -- the tip creates a bit of kerf that's noticeably more brushlike than the fine-tip, which has a metal sleeve around the ink wick. 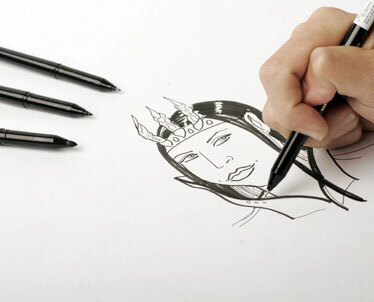 » The 0.6 mm bullet-tip pen lays down a dense, black line that is easily manipulated by varying pressure. A light touch creates a feel almost like a calligraphic brush. » The 1.0 mm bold bullet-tip pen is just like the 0.6, albeit heavier. The inks all dry nearly instantly and don't penetrate off-the-shelf copy paper, much less the drawing board. They're all quite small in heft, so don't expect to make big murals out of these -- they're designed to knock out comic pages, more or less at 100 percent, depending on your nerves and eyesight. In other words, recommended, but with a couple of caveats. They're not all that easy to tell apart, other than a size stamp on the cap and a paper label on the stem. Koh-i-noor's system of using colored caps to denote gauges could be useful here. Also, Sakura's online press materials indicated that the pens won't be sold individually, only as a set, which could become problematic if you become attached to a particular size.